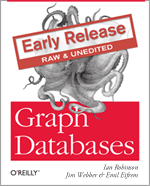 Download the early access release of Graph Databases – O’Reilly Media. Graph Databases is THE book on graph databases. This book discusses the problems that are well aligned with graph databases, with examples drawn from practical, real-world use cases. This book also looks at the ecosystem of complementary technologies, highlighting what differentiates graph databases from other database technologies, both relational and NOSQL. Get your copy of Graph Databases now!